The 24th Rencontres Nationales du Transport Public was held in Bordeaux from 27 to 29 November. It was organised by two French associations, GART and UTP (not to be confused with UITP) which both represent the public transport sector. It therefore included buses and trams, and many of the suppliers, but not coaches. RNTP was held in one large hall in an exhibition centre on the outskirts of Bordeaux. The two main sides of the rectangular hall were in full length glass, on a day that was unseasonably warm and sunny. Coming so soon after Busworld Kortrijk, I had not expected to see many new products, but was pleasantly surprised. Although we read and see a lot about discontent in France with the deeply unpopular socialist President and his Government, with numerous increases in taxation, there still appears to be quite heavy investment in public transport. Several cities have established new tram systems within the last ten years. Registrations of new buses (and coaches) above 8.0 tonnes gross remain the highest in Europe, partly because there is a legal age limit of 15 years for vehicles that carry school children. Old French vehicles find ready markets in Eastern Europe and several parts of Africa. 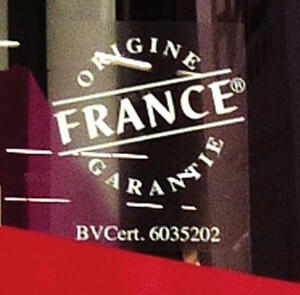 On several vehicles, there were adhesive stickers in prominent places advising ‘Origine France Garantie’. 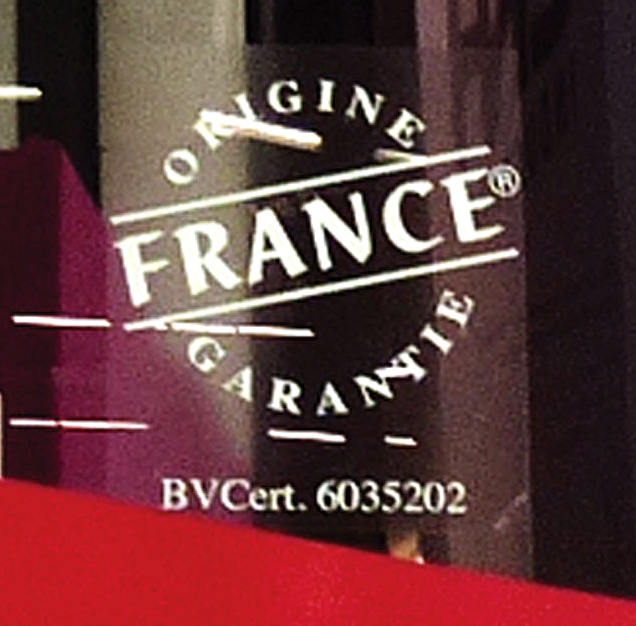 On some stands, there were notices that products had been conceived and produced in France. One industry executive told me: ‘While we know that we cannot insist that French products are bought by public customers under EU tendering rules, we are all more aware that we are tax-payers. We are trying to get across to politicians, who might well be involved in purchasing decisions, that our products are made in France. We think that this counts, particularly in France.’ This seems to be taken seriously, because EvoBus had a prominent photograph of its factory at Ligny-en-Barrois on its stand! Immediately inside the entrance, Iveco Bus was on one side of the main aisle and Heuliez Bus on the other. The 12-metre Urbanway city bus had been launched in May at UITP in Geneva, but the Urbanway range was completed in Bordeaux by the launch of the articulated Urbanway, using the new Euro6 Cursor 9 engine mounted transversely in the rear of the trailer section and developing 400bhp. The Cursor engine is rare, but not unique, at Euro6 levels in relying only on SCR (without EGR) to comply with the new emissions standards. While a transverse engine comes with the additional cost of an angle drive, it facilitates a full width rear platform and double width door. The engine also looks more accessible for routine maintenance. Iveco Bus confirmed that the 10.47m and 12m Urbanways can have either the new 6.7-litre Tector 7 engine mounted vertically and offset in line at the rear, or the Cursor 9 mounted transversely. Because both engines use only SCR, they have smaller radiators than those that also require EGR to meet Euro6 emission standards. On the 12-metre Urbanway, there are also the options of a Euro6 Cursor 8 CNG engine and a hybrid with the Tector 7 engine and BAE Systems drive. 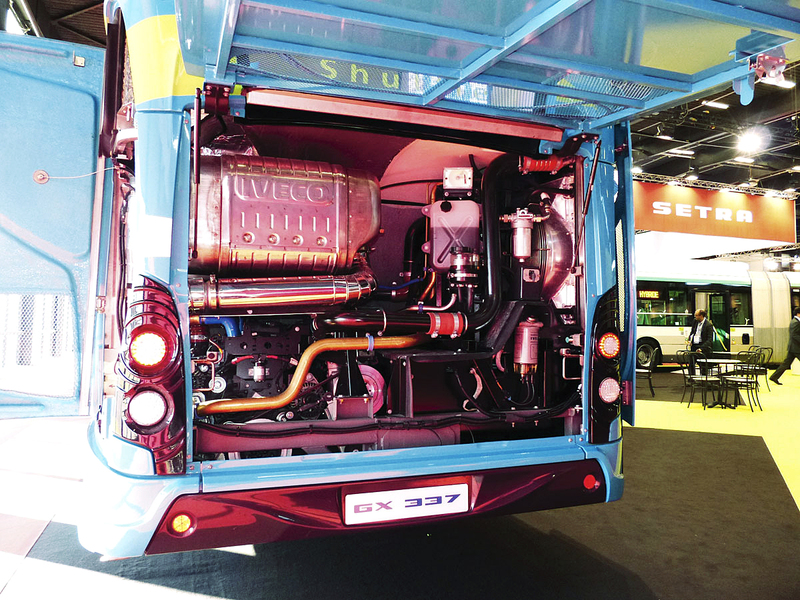 Pierre Lahutte, CEO of Iveco Bus, said that his engineers had worked hard to reduce the numbers and the models in the range for Euro6, but had managed to meet the demand of more market segments. As examples, the rear light assemblies on the whole range are the same. The detachable side panels on the Urbanway are the same as those of the previous Citelis, avoiding the need for Iveco to create new parts and operators to hold them. The Arway interurban coach, and the Recreo school bus will run out at Euro5, being replaced by new members of the Crossway range that is proving to be highly competitive. The rather upright Evadys coach with its simple interior specification and high luggage capacity will also be retired at Euro5, as will the super high deck version of the Magelys. They will be replaced by further models in the Magelys Pro high deck range. Iveco Bus will offer the Urbanway range in three levels. The base models will be those that were in the exhibition. The next level will be vehicles with an interior specification to BHNS (roughly translated as bus at a higher level of service). This will have additional glazing, customised seating and a number of other interior refinements. The top level will be the Crealis, with revised external styling looking more like a tram than a bus and ideally suited for Bus Rapid Transit operations.